At the gates of Blåfjella-Skjækerfjella National Park you can explore the beautiful scenery. Alone or with family and friends - Ice fishing is a fun winter activity. Steinkjer Municipality Forests – Ogndal Bruket KF and Snåsa Fjellstyre have cabins at the gates Blåfjella-Skjækerfjella National Park and Norway’s geographic center. The cabins have a great location with access to fishing lakes and hiking trails just outside. In the lakes there is plenty of trout and char of very good quality. Skjækervatnet, a good fishing lake is just off Skjækerosstua. Lågvatnet at Lågvassbua can also be recommended. In addition, there are many small lakes in the area where you can try your luck. There are ice drills at the cabins, but no ice fishing gear. To get to Skjækerhytta, follow the marked winter path in Norway’s geographic midpoint. The cabin is located 1 km from the center point. Total 9 km walk. There is no ice drill at Skjækerhytta. On the way to the cabins you pass the geographic centre. The border to Blåfjella-Skjækerfjella National Park is on the east side of Skjækervatnet. The national park is one of the largest in Norway and the landscape varies from mighty forest valleys to mountains. Fabulous place for great cross-country skiing trips. Tips for a day trip can be Skjækerhatten and path around Løysmundhatten. There is a winter marked trail from the parking lot at Krokbekken and into Lågvassbua via Norway’s geographical midpoint. To Skjækerostu there is a winter marked trail into Skjækervatnet and from there follow the landscape down to the cabin. 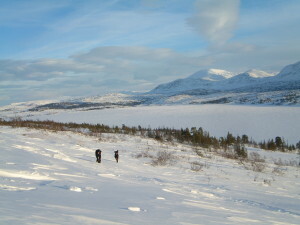 Skjækerhytta is 1 km from the midpoint, in the north-western end of Skjækervatnet. Tracks are being made to the midpoint in the weekends, subject to the weather conditions. We encourage to use skis and dogs, if you have any, to travel into the cabins, but can arrange transport. Remember to bring a map and compass, and possibly GPS. Lågvassbua: sleeps 6 + sleeps 4 in the open part. The cottages have fully equipped kitchens. There are pillows and duvets to the number of beds in Skjækerrosstu and Lågvassbua. In the open part of Lågvassbua sleeping bags must be brought. At Skjækerhytta sleeping bags must also be brought. There are dog cages and ice drills at the cabins belonging to Steinkjer Municipality Forests. The price includes: rent of cabin for two nights. Fishing in the lakes are free in Steinkjer municipality. Transportation is not included, but is carried out by self-employed people with their own licenses.